You need them when you need them...you just hope you don't need them. As advertised, the steel core is virtually unbreakable...but you can break off the 'working ends' if you use the lever for other than removing tires! I use these on my road bike and mountain bike. I guess it's about impossible to make an extra strong lever to install stubborn tires these are not as strong as I had hoped but they're better than the ones I had. A must have for every cyclist!!! This set of tire levers are awesome and you will not be disappointed. They are very strong and the right size to work confortable without worrying if they are going to fail on you and will not damage your rims. I would buy a second set. 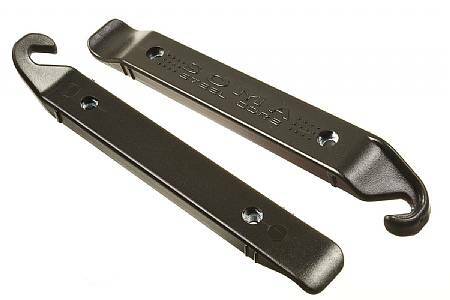 I never thought I would fall in love with something as simple as a pair of tire levers. Don't waste your money on cheap plastic levers. These could mean the difference between being stranded on the side of the road - or getting your flat fixed fast, and moving on. It's a great product! These seem like a great idea in theory. However, the second time I used them, the plastic tip broke off and the metal bent putting on a tire that I had previously put on using normal plastic Kool Stop levers. It was kind of sketchy how it broke too, as the plastic broke into some really sharp pieces. I will be returning these. We do a lot of touring and these levers put my mind at rest. Having a flat is one thing, breaking your tire lever is something else. I don't see that happening with these levers. Broke one of the two Soma levers on the first attempt to remove a tire. Note, the new tires are incredibly difficult to change on my rims, so I expect it is somewhat unusual. I replaced my old levers with the Soma levers due to the advertised steel core. Unfortunately, when attempting to remove my tire, the nylon shell fractured and pulled away from one of the levers leaving an exposed steel bar. The second lever is still holding up well, and I use it along with another manufacturer's lever. In general, I like the levers as they are simple and easy to handle, and I like the feel of the steel weight in the lever. But, like any tire lever, they can be easily broken on difficult tire/rim combinations. The manufacturer agreed to replace the broken lever, under warranty, but never responded after I provided my shipping address. I thought these we a clever answer to a tire lever because it had plastic over metal base. of reinforcing the lever design. Tough tire levers. Use them in my shop, no breaky. Worth a little extra money.